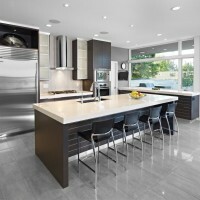 thirdstone inc together with Habitat Studio & Workshop have completed the SD House in Edmonton, Canada. 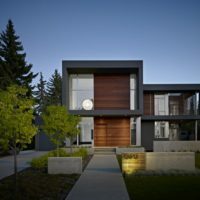 Situated in a quiet residential neighbourhood west of downtown Edmonton, this custom dwelling is a crisp edifice featuring a modern facade with a decisively minimalist profile. Facing north toward the splendour of a mature ravine park, the compact but efficient house was designed entirely to meet the client’s needs while responding to site conditions that visually extend beyond the property edges to the ‘borrowed’ landscape. From the street, the landscape and series of architectural garden walls greet visitors to an implied enclosure, acting as both a territorial passage between public and private and by symbolizing arrival to the homeowner’s domain. The cast concrete is harmonious with the tones of the building’s exterior and asserts its worth within the landscape. The front exterior is regulated by a double-height central volume accented by an extruded aperture extending over the front entrance. The remaining front facade is flanked on the west side by placate outdoor terraces on the main and upper levels. The convenient main level terrace, accessed via the Living Room, is sheltered by the extended roof line above, while the upper terrace – a cubed frame – is open to the sky. The terrace is further animated by sliding ipe screens that provide privacy and solar shade. 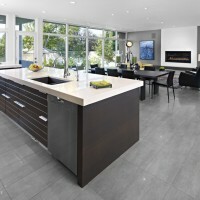 East of the main entry is a recessed tandem garage, deliberately subdued to lessen the impact of a front facing garage. Overall, the exterior finishing is a deftly combined palette of glass, metal, luxuriant ipe and predominately tepid charcoal walls. The double-height interior at the front entry compresses to an average height at the transition to the open main living space, again as a gesture to decipher communal from private. The combined Kitchen, Dining and Living Room are a bright and airy space with an engaging view of the tree-lined rear garden. The extensive glass walls frame the garden and allow the sun’s rays to penetrate the entire space with its warmth and play of daylight. Subtle outdoor lighting provides a visual connection in the evening and to ensure the peripheral senses remain connected with the motioning outdoor amenities. A sculptural steel and open-riser staircase leads to the second floor level and private wing consisting of bedrooms, washrooms, a cosy sanctum, a roof terrace and an exercise room with views through the double-height entrance to the undulating tree tops of the ravine beyond.